The 'Redemption Loves Nothing' Digital Art Collection sees the dawn of the Saiyuki Gaiden characters brought to life! Featuring classic original artwork by the marvellously talented Kazuya Minekura, this first work presents a blood splattered Konzen Douji (aka Genjo Sanzo) caught between the hard edges of cold lament and raw elegance! Minekura has a splendid way about capturing raw emotion in an almost off-handed fashion. These famous illustrations from her art book collection have thus been utilized for the first time ever to reveal all the primordial roots of the well-known and loved Saiyuki heroes! Minekura does have an off hand way of making things raw and beautiful doesn't she? It's nice, I like the color combination... + the fact that I love Konzen anyway and I adore this picture. Genjo Sanzo looks really hot in this picture ! 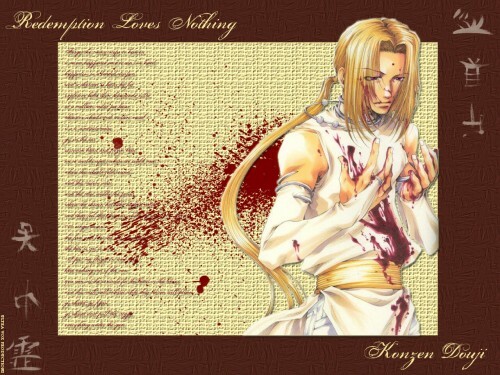 I loved when Sanzo had long hair ! XD But I still like it the way it is . Thanks for posting it ! I like it a lot ! holy hotness.. cool.. thank you so much for the share..
i like the blood on the background.. u rock! Konzen is my top favorite character in Gaiden. May be a meanie but a softie by heart. nyaa konzen<3 *-----*! sale tan kawaii lo adore >w<!